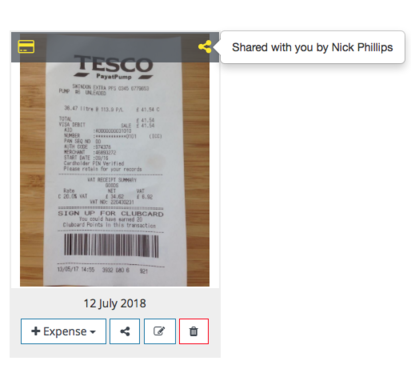 You can share receipts with other users by sending the receipt straight to their account. You can share receipts with other users if your Account Administrator has turned this functionality on. 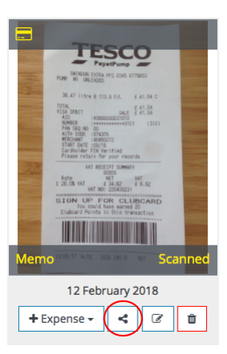 You can share Unattached and Attached receipts. 2. Start typing in the user's name. You can share receipts with multiple people. To remove individuals that you have added, click the x next to the person's name. 3. If you would like to delete your copy of the receipt when you share it then tick this option. When you are ready to share the receipt, click Share! The receipt will be sent to the recipient's Unattached receipt area. They can hover over the Share symbol and see who shared the receipt with them.